Modern molds for making handmade paper are usually covered with a square mesh of fine brass wires. This is a new invention. Old paper molds had a mesh made from large straight brass wires woven together with very fine brass or copper wire. This left a distinctive water make pattern in the paper a common form of which is called laid chain mesh. This is the construction notes for building a loam to weave a laid chain mesh for a hand made paper mold. It also provides detailed instructions on its use. This example is sized for a mold for making paper up to 18 inches by 12 inches, but can be adjusted for other sizes. The mesh is made up of two sizes of brass wire. The fine warp wires weave back and forth in pairs. The much heaver weft wires are straight and run the length of the mold. More details of the handmade paper making process can be found in my description of a paper plant I built some time ago. After a long sabbatical, I am now building new version of most of the parts of the paper plant so that I can place the plans on the Web. Building this loom is a straight forward task requiring only basic woodworking tools and skills. Using the loom is also not difficult but it is a slow labor intensive process. The plans of our major projects are brought to you on the Honor Plan. You may look at as many plans as you like, but when you start to build please pay of the plans you use. These small payments are critical to keeping this Web Site open. Purchasing the brass material locally or over the Web. After you request and receive the three sketches, these notes will help you understand them. This sketch shows the top view of the loom. Note the simple plywood base for supports of the many pairs of fine warp wires at about 0.50 inch spacing. These wires are in pairs. Two dowels cross over the top of the warp wires. One of each pair is connected to each dowel with a loop of thread. When a dowel is lifted, one of each pair of wires raises about one inch. When the other dowel is lifted, the other of the pair is raises. At one end the fine wire pairs are looped around a small brad in the end board. At the other each wire is attached to a rubber band that is looped around a brad in the other end board. The fine warp wires cannot stretch like textile threads do, so a rubber band are added to each wire. The sketch also shows a blade made from flat wood like a yardstick. All its edges and ends are rounded off. It is stuck between the wire pairs and turned to hold them open so that it will be easy to thread a heavy weft wire through. This side view shows the two end boards and the support of the warp lifting dowels. The warp lift supports and one end are held on with screws alone so that they can be moved for different size weaves. This sketch shows the wooden parts needed to make the loom. The mold loom is made from scrap wood and plywood. This is only an estimate (made in Spring 2008). The price may vary in your area. Getting a good price on the brass is critical to keeping the price down. If you can find it locally you will save the high shipping cost, but expect to have a $100.00 minimum order. This device was designed so that it could be built by one person with a modest woodworking skills and tools. These notes are not intended to be a detailed step-by-step construction guide, but rather a number of points to consider. It is your project and you can build it to suit your likes. Size -- The example shown in the sketches makes a mesh for a mold with a deckle of inside dimensions of 18 inches by 12 inches. The same loom can be used of smaller molds but a bigger loom would be needed for larger ones. The final dimensions of the mesh should be just a little bit smaller than the outside dimensions of the finished mold. Weft Wire Gauge -- The gauge of the weft wire needs to be large enough to be stiff and sets the number of weft direction marks that will appear per inch in the final paper. The 16 gauge used in this example will produce between 12 and 14 lines depending on how tightly you weave them. Warp Wire Gauge -- The warp wire needs to be fine and flexible. The 26 gage wires in the example are about as fine as are easily available. The 0.5" spacing in the example may be wider than you want. Material substitutions -- This design is intended to be largely made from scrape materials. Feel free to adjust the materials and dimensions. 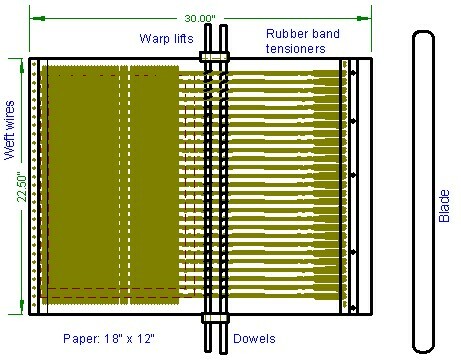 Direction of Weft -- The stiff weft wires normally go in the direction on the mold in which the get support from the mesh support slats. These usually run across the shortest dimension so the weft usually run along the longest dimension. Cut out the plywood base. It should be flat and maybe anywhere from 0.5" to 0.75" thick. The ends pieces are simple pieces of wood a convenient height. Soft wood like pine or popular is best as you have to drive a lot of brads into them. One end is fixed and may be glued. The other end may screwed by not glued so that it can be adjusted for the width of the mesh. Installing the ends with 0.75" square wooden blocks helps brace them against the force of the weft wires. Cut the head of a brad. Chuck it into a drill and make pilot holes for the line of brads. Drive one row of small brads in the fixed end piece at the space you have selected, usually 0.5 to 0.35 inches. These brads need only stick up far enough to take a loop of fine warp wire. Repeat the process for double row of brads on the adjustable end. These brads need to stick up far enough to take a rubber band. The two warp lift supports are simple pieces of wood. Dado notches along the bottom help keep the supports straight up. Drill holes for the dowels and then cut the holes into notches with a jig saw. You can make it a little higher if you like. The blade is a long, thin piece of wood like a yard stick. Round the ends to make it easy to work them through the warp wires. Round all the edges so that blade will slide smoothly over the warp wires. Now that you have built a loom, here is how to use it. Cut pieces of fine weft wire long enough to run the length of the loam twice. Double the wires over and make a small loop by twisting the wires one full turn. Place the loop over a single brad in the fixed end of the loom. Loop a rubber band round a brad in the adjustable end of the loom and run the wire through it. Pull the rubber band out about one inch and twist it back on itself. Trim the warp wire but leave some length for later adjustments, especially for wide meshes. Repeat with a second rubber band for the other wire in the pair. Place one dow rod in the lower position of the support. Loop thread or unwaxed dental floss around the dowel and down to one of a warp wire pair. Tie the thread loop to the towel and secure the not with a dot of thermal glue or nail polish. Repeat for one wire in each warp pair. This process takes some time. Repeat the looping process on the second dowel for the other wire in each pair. Unroll the stiffer weft wire from the coil and cut it into pieces the length required. One at a time place the end of a wire in a vice and pull on it with a pair of Vicegrip pliers. You need to put the length out about one inch. This will straighten and work harden the weft wires. Trim off the damaged ends of the weft wires and store them in a bundle being careful to keep them straight. You are now ready to start weaving. Lift one dowel and place it in the high position. Work the blade through the warp pairs being sure that one wire from each pair is above and one is below the blade. Turn the blade 90 degrees to hold the pairs open. Work one weft wire through next to the blade. Turn the blade flat and use it to push the weft wire hard against the warp wire loop twists. You want the weft wires to noticeable bend up and down around the weft wire. It is helpful to secure this first weft wire in place. This can be done by soldering it to the twists in the warp wire pairs in a few places. If you do not have an electronic soldering iron, you may use a heat gun or clear finger nail polish. Whatever you do keep the weft wire pushed hard up against the twists and keep the sealing material on only the twist side of the wire. Continue the process of alternating which dowel is lifted, working the blade through, and then following with a weft wire. Pack the weft wires as tightly together as you can. A course hair comb may be helpful for pushing on the weft wires. You may wish to work with the cross section of your blade until you get it just the way you like it. You will need to adjust the position of the warp lifts from time to time to keep them in the center of the unwoven warp wires. IF the rubber bands get too tight, untwist the each warp wire and reform the loop farther down the wire. Continue the weaving process until the mesh is just a little narrower than the mold. The rubber bands should now be stretched out much longer than when you started. When you are sure it is just the right width, cut the warp lifting threads and get the dowels and their supports out of the way. Carefully cut each pair of warp wires one pair at a time. Leave the outside two pairs on both sides until last to help hold the shape of the mesh. Twist the two warp wires tightly to hold the outside weft wire. Remove the two rubber bands. Secure the twisted wires as before with hot glue, solder, or finger nail polish. You may have to cut the four outside pairs all at once to prevent the uneven tension from distorting the weave. Simply lay the mesh of the base and finish twisting these four pairs. Remove the warp loops from the fixed end of the loam. Check the fit of the mesh on the paper mold. If necessary remove a weft wire or two. Twist and deal all the weft wires along both sides. Trim the ends of the weft wires to fit the mold. They should not drag on the inside of the deckle. You can stake the outside warp wire pairs with hot glue, solder, or finger nail polish. If you need to store or ship the mesh, keep it flat between two pieces of corrugated cardboard. Check our notes on mold and deckle construction for ideas on installing the mesh. Congratulations on completing a very senior woodworking project. Thanks again of using Woodware Designs Plans. We very much want to know how you are getting along with your project and will be happy to answer any questions by e-mail. If you send us a picture of your finished project, we can put it on our Web page. We need pictures of projects with real people using them.